Bobby: “Yes Bertie. This is your… ONE HUNDRETH BLOG! A century of stories. A week late after last week’s headache.” (Trevor is getting a little full of himself. More later). His student Bobby has a rather different take, dominated by me. 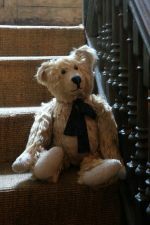 The Bear that he created as Mindfully Bertie. And has now given rise to one hundred blogs! Townhouse above which the course was held that saw the creation of Mindfully Bertie. Townhouse courtyard … tea and cakes. We wrote a blog on this house where Diddley’s daughter Amber once lived. Charlie and friend organised the Open Gardens for the NGS (National Gardens Scheme). You won’t believe it, he has talked so much we haven’t got time for every house. And he’s lost the house numbers! Sill old sod. So, where the Gentle Author takes so much care and research with his blog, every day, his pupil lives on a wing and a prayer. Variety, of course, is the spice of life. Justine and Bobby across the road. Justin’s fashion display in Wilkes Street. Halfway down the stairs (take 2). This was the very first “Lighting a Candle for Diddley”. Here at Laurel Cottage. There has now been one hundred candles lit in every type of place imaginable. If you would like to Light a Candle for Diddley, just let me know with a photograph and a few words.